Condylar and subcondylar fractures constitute 26-40% of all mandible fractures (see the image below). Sectional anatomy of the mandible with frequency of fractures. Given the unique geometry of the mandible and temporomandibular joints (TMJs), these fractures can result in marked pain, dysfunction, and deformity if not recognized and treated appropriately. These fractures may be associated with other injuries that alone have significant morbidity. Examples of such injuries include but are not limited to facial nerve injuries, C-spine injuries, displacement of the mandibular condyle into the middle cranial fossa, injuries to the external auditory canal, and occlusion of the internal carotid artery. A thorough understanding of the anatomy and physiology of the masticatory system is therefore essential in understanding and treating fractures of the condyle and subcondylar region. The first pharyngeal arch gives rise to the tissues that eventually form the mandible. Therefore, this intramembranous bone develops around the ventral cartilage of the first branchial arch. The mandible continues to grow and develop throughout childhood and adolescence. The eruption of teeth promotes the formation of alveolar bone, but the condyle is a major growth center for the mandible. The existence of panfacial deformities when the condyle is damaged before complete growth and development is well documented. The mandible, like the ribs, is curved and articulates at both ends, but unlike the synchondroses that connect the ribs to the sternum and the vertebral column, TMJs are diarthrodial and allow both rotational and translational movement (see the image below). Movement of the temporomandibular joint (TMJ). The anatomy of the TMJ is well suited to its function. The articular eminence and the superior portion of the mandibular condyle are covered with fibrocartilage, while the articular disc is composed of dense collagenous connective tissue. The disc itself is without sensation, but the retrodiscal tissue, a loose areolar connective tissue, is well innervated. The jaw opens first by rotation of the condyle within the inferior joint space and then by translation of the condyle and disc in a downward and forward direction; thus, while rotation occurs in the inferior joint space, translation occurs in the superior joint space. Rotation alone allows approximately 20-24 mm of interincisal opening, which is the distance between incisal edges of the maxillary and mandibular incisors. Normal maximum interincisal opening meets or exceeds 40 mm, and to accomplish this, translation is necessary. The tooth-bearing facial skeleton, the dentition, and the TMJs together form an interdependent tripartite complex where disruption of any single part can result in marked difficulties in the others. As a corollary, considering all 3 parts in the reconstruction of an injury to any one part is necessary. The significance of this concept is elucidated more clearly as treatment alternatives and rationales are discussed. Unilateral fractures occur approximately 3 times more frequently than bilateral fractures do, but bilateral fractures are not uncommon. The frequency of these injuries does not seem to differ significantly from location to location. The etiology of these injuries varies in accordance with both sociologic and age factors. In the Netherlands, for example, where bicycling is a common form of transportation, cycling accidents are the primary cause of condylar/subcondylar injuries. In large American cities, the most common etiology for the same injuries may be either motor vehicle accidents or interpersonal violence, depending upon the characteristics of the city. In New York and San Francisco, for example, where population density is high and traffic is congested, interpersonal violence is far more common, while in the Midwest, where traffic moves faster and where land is available for all-terrain vehicle use, these fractures are more commonly a result of vehicular accidents. Among children, falls and playground and bicycle accidents are the usual causes of these injuries. The clinical presentation of condylar/subcondylar injuries may be either straightforward or quite subtle. An awareness of the mechanism of potential injury, as well as the specific signs and symptoms that should raise the index of suspicion, is therefore helpful to the clinician. History, physical examination, and radiographic studies form the mainstays of diagnosis (see the image below). Clinical presentations suspicious for condylar/subcondylar fracture. Falls, blows to the contralateral face or ipsilateral preauricular area, or chin injuries should alert the examiner to the possibility of a condylar/subcondylar injury. Because of the U-shaped mandibular anatomy, patients thought to have a single mandibular fracture often have others. Also, the patient with a subcondylar fracture often has another mandibular fracture. Nevertheless, an isolated subcondylar or intracapsular fracture is quite possible. Contusions over the chin or preauricular area, hemotympanum, and malocclusion are all potential signs of a condylar or subcondylar fracture. Less commonly, a facial nerve deficit may be associated with an injury to this area. The examination must therefore include assessment of the patient's occlusion and facial nerve function. For all practitioners, and especially for the practitioner not trained in dental anatomy, ascertaining from patients whether or not they notice a change in their own occlusion may be helpful. Of course, such evaluations are not fail-safe because the presence of multiple fractures and/or injury to the inferior alveolar, lingual, and/or facial nerve may skew patients' perception of their own clinical situation. Thus, all who intend to treat these types of injuries must become cognizant of normal mandibular range of motion parameters, as well as normal occlusal patterns and intraoral clues (eg, wear facets) that provide a guide to the patient's premorbid occlusion and functional relationships. In the patient with multiple fractures, obtaining dental study models may greatly facilitate treatment, while significantly decreasing intraoperative time. Plain radiography (most commonly) and CT scanning help to ascertain the location of the fracture, the degree and direction of displacement, and the presence or absence of associated injuries. All of this information is integral to developing an appropriate treatment plan for the patient (see the image below). Radiographic views of subcondylar fractures. Panoramic radiography is a useful study. Properly taken, this modality allows examination of the entire mandible, both TMJs, the maxilla, and the maxillary sinuses. Unfortunately, the equipment necessary to obtain radiographs is not available in every treatment facility. 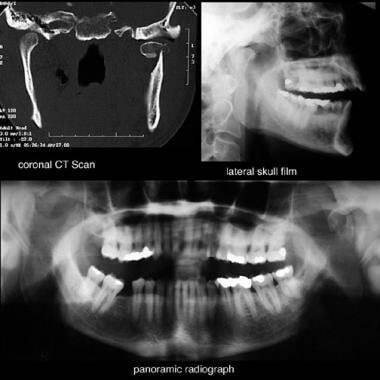 If panoramic radiography is unavailable, bilateral lateral oblique views of the mandible can allow the surgeon to view the condyles and subcondylar areas. In 30° anteroposterior (AP) skull radiography (ie, Towne view), the head is positioned so that the condyles and subcondylar area are not obscured by the base of the skull. By positioning the head and film in this manner, the condyles and subcondylar area are visualized. This view is particularly helpful for ascertaining the mediolateral position of the respective fractured segments, information not readily available from a panoramic view. CT scanning in axial and coronal planes can yield much information about this area provided that the sections are sufficiently close to obtain images of the area and provided the practitioner is intimately familiar with the pertinent anatomy. However, CT scanning is not the preferred imaging modality for most mandible fractures, including those of the condyle. CT scanning does provide the most information about intracapsular fractures. For further reading, see Medscape. Common medical opinion strongly agrees that isolated intracapsular fractures, in almost every instance, should be treated solely with physical therapy. While these fractures can result in significant anatomic/radiologic changes in the appearance of the condyle itself, most patients with these fractures do well if properly rehabilitated. Late complications (eg, degenerative joint disease) are possible, but again, with appropriate rehabilitation (in the absence of other fractures and generalized joint disease), these patients tend to do well. In the early rehabilitative phase, controlling the occlusion (usually by means of arch bars and elastics) while emphasizing return of normal range of motion is important. The patient should receive occlusion-guiding hardware and instruction in range-of-motion exercises immediately postinjury. The patient must be carefully monitored. Not surprisingly, younger patients seem to return more quickly to the premorbid state than do older patients, but even elderly patients, with appropriate rehabilitation, tend to do well with these injuries. The patients who encounter trouble are generally those in whom the fracture is undiagnosed and those who, for reasons of pain, do not immediately resume a normal range of mandibular motion. These patients then heal in anatomically incorrect and nonfunctional configurations. Once a mandibular malunion has occurred, mandibular motion, in some cases, cannot be reestablished without surgical intervention. Patients who are edentulous entail special consideration. Certainly, preexisting dentures or gunning splints may be wired in and adapted for interarch elastics. In most cases, however, an equally good outcome can be obtained with careful physical therapy that trains patients to open to a normal distance without deviation. Some patients require preexisting dentures to be remade or relined. Often, the denture is broken in the same incident that caused the intracapsular fracture. Some patients may be able to wear their preexisting prostheses during and after rehabilitation. The subcondylar fracture poses a different and more complicated set of questions. Most practitioners agree that most subcondylar fractures can be treated in a closed fashion. Closed treatment, as above, implies control of the occlusion, aggressive physical therapy, and close follow-up. Additionally, most practitioners agree that children should generally be treated with closed reduction. Often, children require only nonoperative management, ie, close follow-up of occlusion and function and reassurance to the parents that it is not only acceptable but also desirable for the children to resume normal range of motion activities. Animal studies also confirm that closed reduction is an acceptable and successful form of treatment for most of these fractures. In 1960, Walker studied unilateral fracture dislocations in growing monkeys. Two fractures were replaced in their normal position, and 4 were left displaced, but all healed with normal shape and normal function. In 1967, Boyne replicated the study, this time creating bilateral fractures and once again showing that all animals ended with normal function and normal anatomy. In 1991, Zhang et al performed a similar study with adult rabbits and showed that, in this population, miniplate reduction provided a better final symmetry than closed reduction, but closed reduction was better than free condylar grafting. The reader should decide whether extrapolating this to humans, who are biologically different and capable of undergoing goal-directed physical therapy, is reasonable. According to Bradley, "The necessity for precise anatomical repositioning, so desirable in other sites in the mandible, does not apply in the case of condylar fractures where the bony displacement will be compensated by changes in the pattern of muscular activity, mediated by proprioceptive impulses derived from the periodontal membranes and soft tissues surrounding the joint." Collective experience seems to support this opinion. An important corollary, however, is that when rigid fixation is chosen as the treatment method it is an absolute necessity for the condyle to be rigidly fixated in the appropriate position. The physician must avoid rigidly fixating the condyle in a nonphysiologic position. The authors themselves state that the "relative indications are arguable and patients may be treated differently by each surgeon." In fact, Zide further modified and expanded his absolute and relative indications in a later article. Although edentulous bilateral fractures occur in which constructing a splint is difficult, the author has yet to see a case in which it was impossible. Situations exist, however, in which a patient does not easily tolerate such an appliance. For cases of bilateral edentulous fractures, the second indication is the most common reason for opening at least one side; however, in patients who are cooperative, dentate, and nonmedically compromised, even bilateral fractures can often be managed with arch bars, elastics, physical therapy, close supervision, and follow-up. On the other hand, patients who are uncooperative, enfeebled, or in whom a stable AP mandibular position cannot be maintained would certainly be considered (by most facial trauma surgeons) as candidates for open reduction and rigid internal fixation (ORIF). Despite excellent reduction and fixation, the overall outcome of a patient treated with ORIF alone (ie, without physical therapy) is likely to be compromised. Corollary principle: A patient with aesthetic form and normal function as the final result is the goal of treatment. The appearance of the radiograph is insignificant when these 2 goals have been met. Open reduction does not by itself guarantee that these goals will be met, and, in most cases, these can be met with closed reduction, meticulous postoperation physical therapy and follow-up. Clinical judgment and consideration of other medical conditions must always influence the treatment choice for any particular patient. Finding subcondylar fractures in association with other mandibular fractures, usually in the symphyseal/parasymphyseal region and sometimes more posteriorly, is not uncommon. In this case, the standard principle of appropriately and anatomically reconstructing the tooth bearing portion of the jaw first applies. Once this portion of the mandible has been rigidly fixed through the practitioner’s method of choice appropriate for the patient at hand, the treatment algorithm for the condylar/subcondylar fractures is unchanged from what has previously been discussed. Corollary principle: Failure to correctly reconstruct the other mandibular fractures prior to addressing management of the condylar/subcondylar fracture(s) will result in failure to appropriately manage these fractures. The patient who has both bilateral condylar fractures and comminuted midfacial fractures poses a challenge for the reconstructive surgeon. Traditionally, such patients were reconstructed bottom up, inside out. With the advent of rigid fixation, reconstructing from the outer facial frame as described by Gruss is also possible. The surgeon thus takes into consideration the degree of comminution, the associated injuries, and the state of the dentition when determining whether to open one or both subcondylar fractures in such a patient. ORIF can facilitate the care of the patient with an orthognathic problem that predates the fracture, but splints can be constructed to facilitate the care of these patients as well. Even if such patients are to be treated in an open fashion, models should be made and splints should be fabricated for intraoperative use. A millimeter of error at the fracture line may not be apparent to the operator, but a millimeter of error at the occlusion may be apparent to the patient. Of course, some complications may arise with any treatment modality, and many of these (eg, pain, infection, edema, malocclusion, trismus, ankylosis, extrusion of the dentition, edema) can occur with either closed or open treatment, especially if appropriate physical therapy is not part of the treatment plan. However, some complications are associated more with open treatment. These complications include avascular necrosis of the condylar head (particularly when the condyle is removed, plated on the back table, and reinserted as a free graft), injury to the facial nerve, hemorrhage during approaches to the condyle, and nonunion. Remember that, according to Alpert, "in most cases open techniques prove no better than closed techniques for most types of condylar fractures. As such, there are few indications to risk the complications of open repair of the fractured condyle." Nevertheless, some cases occur in which, for a variety of reasons, surgeons and patients together choose open treatment. The final choice of treatment modality for each individual patient takes into account a number of factors, including position of the condyle, location of the fracture, age of the fracture, character of the patient, age of the patient, presence or absence of other associated injuries, presence of other systemic medical conditions, history of previous joint disease, cosmetic impact of the surgery, and desires of the patient. Finally, if the patient is to be treated with a closed procedure and has other mandibular (not condylar or subcondylar) fractures, treatment of the patient is greatly facilitated if the other fractures can be fixated rigidly so as to allow immediate commencement of physical therapy. Four weeks of maxillomandibular fixation (MMF) to treat the other fractures is not optimal for subcondylar fractures and is contraindicated for intracapsular fractures because risk of ankylosis, adhesion, and/or hypomobility is increased with such treatment. Remember that most often these subcondylar fractures are encased in a muscular sheath between the masseter and the medial pterygoid; thus, they are splinted and well supplied with blood. Correctly placed arch bars, Ivy loops, or other devices from which elastics can be suspended to control and guide the occlusion are essential. In the edentulous patient, dentures or gunning-type splints can be affixed to the maxilla and mandible via wires and/or screws and serve the same purpose. Instruct the patient to wear elastics 24 hours a day for the first several weeks, removing them only to perform physical therapy exercises and oral hygiene. Remember that elastics stretch as they absorb moisture from the oral cavity; therefore, teach the patient how to change the elastics daily. For most patients, a single elastic at the canine/premolar region bilaterally suffices. Adjust diet for comfort; most patients eat a mechanical soft diet for the first few weeks. At approximately week 3-4 (depending upon the individual), switch patients to elastics only at night, with instructions to resume 24-hour wear if they notice their bite drifting during the day. After 1-2 weeks with only nighttime elastics, the patient then switches to elastics every other night. If the bite remains stable after a week of this, discontinue the elastics and keep the patient in appliances for 1 more week. Again, if no change occurs in the occlusion after 1 week, remove the appliances (eg, arch bars, Ivy loops). The previous schedule can be compressed or expanded depending upon the individual patient's response. Of the utmost importance for all patients, whether treated with closed or open techniques, is compliance with physical therapy regimens. These regimens do not require the patient to visit a rehabilitation center or to have any outside personal assistance (except for patients who are very young and/or some with physical or mental disabilities). Rather, physical therapy consists of a series of opening exercises. Some devices on the market, such as the Therabite or EZ Flex, can assist a patient with these exercises. An alternative and inexpensive method consists of a stack of tongue blades that can be increased in number each day (see the image below). Regardless of the device chosen, during week 1, the patient should begin active range of motion. That is, patients should attempt to open widely using only their own masticatory musculature. If sideward deviation is noted during this period, they are instructed to place a hand on the side of the face toward which the deviation is occurring and place gentle medial pressure as they open and close. In week 2, passive opening begins. Fingers, tongue blades, or exercise devices may be used. Normal mandibular range of motion is 40 mm or more between the incisal edges of the anterior maxillary and mandibular teeth. In most patients, this distance should be achievable by week 2, if not sooner. Once the patient has reached the minimum goal of 40 mm, continued work in the straight opening plane is augmented with lateral and protrusive movements. The treatment is not complete until the patient has both a stable occlusion and normal function. Many providers do not remove hardware until both goals have been achieved; the removal thus serves as an additional motivational factor for some patients. The result of an appropriate physical therapy regimen is a functional joint and masticatory system with little or no deformity. Remember that every patient who undergoes open reduction still needs to complete adequate physical therapy as described in Treatment Procedures – Closed Reduction. The goals here also are the restoration of both normal range of motion and a stable occlusion. In all but a few edentulous cases, occlusal control is established via arch bars, orthodontic brackets, Ivy loops, or other hardware devices prior to approaching the fracture. These devices are then present for use in guiding the occlusion and masticatory muscles after surgery. Intraoral approaches (also discussed in the above-mentioned book) include the mandibular vestibular incision with or without the use of an endoscope. In both cases, a transbuccal trocar for the placement of some or all of the screws is usually necessary. In some centers, use of an endoscope to assist with visualization of the fracture has become popular, and new instrumentation is being developed daily. In many cases, however, the use of the endoscope can add quite a bit to the length of the procedure and therefore to the anesthetic time and hospital charges without adding a great deal of useful information except, perhaps, for research and development purposes. As equipment improves and operator experience is increased, operating times are expected to be reduced. The next important issue to consider is whether endoscopic reduction actually significantly improves functional and aesthetic goals when compared with properly performed and followed closed reduction or if it simply provides more attractive radiographs. Whatever approach is chosen, once the fracture is exposed, it must be reduced. Whether the fracture must be fixated and how stable that fixation should be are also topics of much debate. A 1980 study looked at a series of patients who had condyles significantly displaced out of the fossa who underwent open reduction without any fixation. The surgeons argued that this prevented a significant malunion, while avoiding rigidly fixating the condyles in a nonphysiologic position. In essence, each of these markedly displaced fractures was converted to a nondisplaced fracture and then treated as such with occlusal control and physical therapy. If the fracture segment is small enough, some surgeons advocate condylectomy. This procedure simply removes the proximal segment altogether, while controlling the occlusion. The patient participates in extensive physical therapy. Wire fixation and intramedullary pins have also been used to stabilize these fractures. Again, occlusal control and physiotherapy remain crucial to successful outcomes. In some cases, external fixators (eg, Joe Hall Morris-type appliances) have been used with good success but poor aesthetics. Once again, occlusal control and physiotherapy are crucial to successful outcomes. Finally, miniplates and screws are discussed. Argument exists as to whether these constitute rigid fixation. Likely they do. Certainly, a miniplate that fixates the condylar segment in a nonphysiologic position sets up the patient for pain, poor function, and degenerative joint disease (see the image below). The patient was compliant with postoperative physical therapy; however, the condyle was rigidly fixated incorrectly, leading to marked deviation on opening. Intracapsular fractures are best treated closed. Fractures in children are best treated closed except when the fracture itself anatomically prohibits jaw function. Most fractures in adults can be treated closed. Physical therapy that is goal-directed and specific to each patient is integral to good patient care and is the primary factor influencing successful outcomes, whether the patient is treated open or closed. When open reduction is indicated, the procedure must be performed well, with an appreciation for the patient's occlusal relationships, and it must be supported by an appropriate physical therapy and follow-up regimen. A particularly well-written and scientific review of the biologic factors involved in the treatment of condylar fractures can be found in the article from Ellis and Throckmorton in the footnotes. For excellent patient education resources, see eMedicineHealth's patient education article Broken Jaw. Vranis NM, Mundinger GS, Bellamy JL, et al. Extracapsular Mandibular Condyle Fractures Are Associated With Severe Blunt Internal Carotid Artery Injury: Analysis of 605 Patients. Plast Reconstr Surg. 2015 Jun 15. [Medline]. Hackenberg B, Lee C, Caterson EJ. Management of subcondylar mandible fractures in the adult patient. J Craniofac Surg. 2014 Jan. 25 (1):166-71. [Medline]. Walker RV. Traumatic mandibular condylar fracture dislocations. Effect on growth in the Macaca rhesus monkey. Am J Surg. 1960 Dec. 100:850-63. [Medline]. Boyne PJ. Osseous repair and mandibular growth after subcondylar fractures. J Oral Surg. 1967 Jul. 25(4):300-9. [Medline]. Zhang X, Obeid G. A comparative study of the treatment of unilateral fractured and dislocated mandibular condyles in the rabbit. J Oral Maxillofac Surg. 1991 Nov. 49(11):1181-90. [Medline]. Walker RV. Condylar fractures: nonsurgical management. J Oral Maxillofac Surg. 1994 Nov. 52(11):1185-8. [Medline]. Alpert BA. Fractures, Mandible, Condylar and Subcondylar. Oral Maxillofac Surg Clin North Am. 1999. 2(2):262. Healy SM, Zwickey MR, Stamboulieh JN, Throndson RR. Closed reduction of an intracranially displaced subcondylar fracture: a case report. J Oral Maxillofac Surg. 2008 Feb. 66(2):389-93. [Medline]. Kuntamukkula S, Sinha R, Tiwara PK, Dushyanth P. Dynamic Stability Assessment of the Temporomandibular Joint as a Sequela of Open Reduction and Internal Fixation of Unilateral Condylar Fracture. J Oral Maxillofac Surg. 2018. 1-12. Naik K, O'Connor BG, Torroni A. Postoperative Quality-of-Life Analysis of Open Versus Closed Reduction of Mandibular Condyle Fractures: Our Experience. J Oral Maxillofac Surg. 2018 October. 76 (10, Suppl):e10. [Full Text]. Horswell BB, Pospisil OA. Nasal symmetry after primary cleft lip repair: comparison between Delaire cheilorhinoplasty and modified rotation-advancement. J Oral Maxillofac Surg. 1995 Sep. 53(9):1025-30; discussion 1031-2. [Medline]. Ellis EE, Zide MF. Approaches to the Facial Skeleton. Philadelphia, Pa: Lippincott Williams & Wilkins; 1995. Ho SY, Liao HT, Chen CH, Chen YC, Chen YR, Chen CT. The radiographic and functional outcome of bilateral mandibular condylar head fractures: a comparison between open and closed treatment. Ann Plast Surg. 2015 May. 74 Suppl 2:S93-8. [Medline]. Assael LA. Open versus closed reduction of adult mandibular condyle fractures: an alternative interpretation of the evidence. J Oral Maxillofac Surg. 2003 Nov. 61(11):1333-9. [Medline]. Haug RH, Assael LA. Outcomes of open versus closed treatment of mandibular subcondylar fractures. J Oral Maxillofac Surg. 2001 Apr. 59(4):370-5; discussion 375-6. [Medline]. Haug RH, Brandt MT. Traditional versus endoscope-assisted open reduction with rigid internal fixation (ORIF) of adult mandibular condyle fractures: a review of the literature regarding current thoughts on management. J Oral Maxillofac Surg. 2004 Oct. 62(10):1272-9. [Medline]. Haug, RH, Brandt, MT. Open versus closed reduction of adult mandibular condyle fractures: A review of the literature regarding the evolution of current thoughts on management. Journal of Oral and Maxillofacial Surgery. J Oral Maxillofac Surg. November 2003. 61:1324-1332. Ellis E, Throckmorton GS. Treatment of mandibular condylar process fractures: biological considerations. J Oral Maxillofac Surg. 2005 Jan. 63(1):115-34. [Medline]. A tongue blade was placed across the molars as the patient bites down. The tongue blade thus represents the occlusal plane. The lower picture shows the patient's occlusal relationships in detail. The panoramic radiograph and occlusal relationship depicted are found in an 18-year-old man who is otherwise healthy. He reported jaw pain for the last 2 days, and his discomfort began after he fell while running hurdles during track practice. Pictured are the preoperative CT scan, final occlusion, and function for this 42-year-old man. The CT scan reveals bilateral medial pole shear fractures of the condyles. This patient was treated with guiding elastics and physical therapy alone. The medial pole shears did not pose an impediment to function, and despite poor social conditions (ie, homelessness, unemployment), the patient was motivated to cooperate with his physical therapy regimen. As a result, at the end of treatment he was free of pain with excellent function and without any discernible deformity. These results demonstrate the importance of an appropriate supervised physical therapy regimen and prove that open treatment of at least one of the condylar fractures is NOT always mandatory to re-establish facial height and anteroposterior (AP) projection.